I never really considered myself a sneaker collector. I would pick up three or four pairs of sneakers a year that caught my attention. I kind of have a casual approach to fashion and will often dress down with a plain tee and jeans and throw on a pair of kicks that would probably go with nothing else in my closet. Among the regular rotation are a pair CNCPT Lobsters, What The Dunks and the Peacocks. Just before leaving to come down to New York I sold a few pairs and thought that my sneaker days were behind me. I brought down a pair of The Hundreds x Gravis shoes, a pair of SBs and as a departing gift I splurged and bought a pair of the Supra Strapped Suede's. With that being said I now find myself in my one bedroom in the LES with 10 pairs of shoes ranging from the Supra x Palms Skytop, Alife Slips to a pair of Jordan Team Elite II's and now thanks to Kiya co-owner of Turf in San Mateo I now have a pair of the Supra TUF Black Duct Tape Skytop. The Skytop has become one of the most recognizable Supra silhouettes. 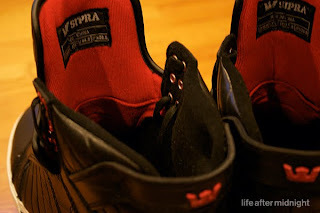 It is refreshing to see Supra expanding so rapidly and challenging the SB market and having such success. I credit Nike SB for what they have done for the footwear market but at the same time feel that the Nike exects feels that they can hit cruise control and 'roll in it' while not really pushing the envelop, which led to their earlier hype and success. Either way over the last year or so I have fostered a passion for the Chad Muska Signature shoe partly to do with the silhouette itself but also the level of creativity and experimental nature that goes into each Supra Skytop release. Risk taking in my opinion is no longer on the agenda of the Nike SB team as we are seeing repetition in colorways and concept. I understand that Supra has become more of a fashion friendly footwear company versus the more skate driven nature of Nike Skateboarding but I have to believe that the skate community would find this refreshing. I am no shoe expert and I will not argue with those of you who feel that they don't go with every outfit. I will also agree that at times the shoe comes dangerously close to being awkward. However there are so many details on this shoe that make it great. I am skeptical about the Supra Skytop sequel but at the same that is just another reason I have become so fond of Angel Cabada's skate and street inspired footwear. They are not out to please everyone and they are not content with hitting cruise control or pushing safe design and colorways. They are out to create dialect and challenge what has become a carbon copy skate market. Thanks to Kiya and TURF for sending over the shoes. Check out TURF here or if you are in the San Mateo area swing over to 380 1st Ave San Mateo, CA and say what's up.